DELUXE GULF FRONT KING BDR & LIVING ROOM, 2 BATHS, BUNK ROOM, FREE Bch Serv. Tidewater Beach Resort is a first class resort on the world’s most beautiful beach featuring: 636 feet of white sandy beach front, 2 outdoor lagoon pools, one indoor heated pool, 2 hot tubs, 2 steam rooms, 2 saunas, 2 -16 person Roman Spas, 2800 square feet exercise facility, game room, rental wave runners, tiki bar, indoor sandwich shop, movie theater in season, conference center, free wireless internet, 7 high speed elevators, and covered walkway from parking deck and 20 minutes from a international airport. 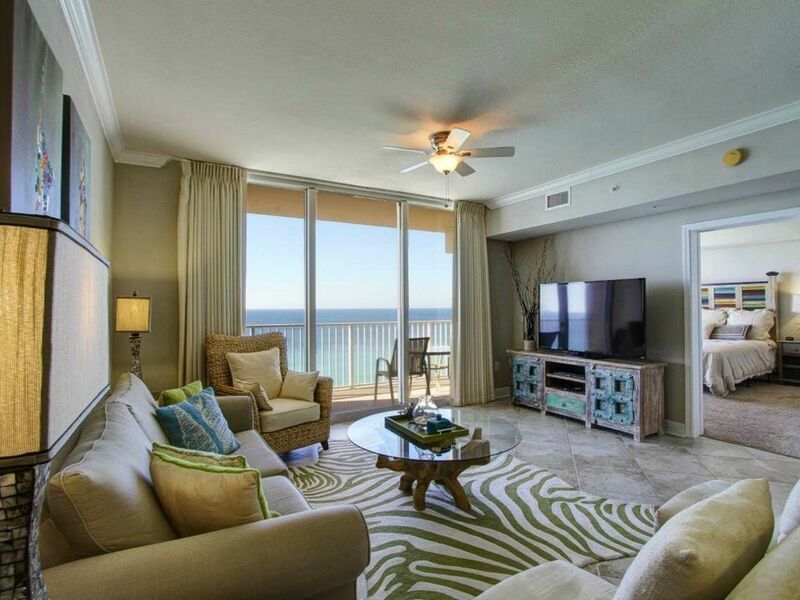 Discover the beauty of the emerald coast and spectacular sunsets directly on the Gulf. Our highly rated one bedroom(king), two full bath condo with separate bunk area, and commercial queen pull out sofa has been totally remodeled. The furnishings and paintings were designed specifically for this condo. The master is on the gulf unlike most of the 1 bedroom condos. We offer free beach service with double padded chaise lounges with umbrella. The condo has a 30 foot balcony accessible from the bedroom or family room and is located on the 12th floor without road noise and just the sound of waves and kids playing on the beach. The kitchen is fully equipped with side by side refrigerator, microwave, stove, dishwasher, utensils, and washer/dryer- separate alcove in condo. Internet service is free. The family room has a 60 Inch Smart TV and DVD player whereas bedroom has 42 inch TV with built in DVD player. Please come down via car or plane and relax, recharge, and totally enjoy a most pleasurable vacation!! Tidewater beach is within walking distance(1/3 mile) from Pier Park(900,000 square feet of Shopping, Entertainment, and Dining) on Front Beach Road in the new and convenient west end of Panama City Beach. Pier Park Opened in 2008 with noteworthy restaurants such as Jimmy Buffet’s Margarittaville. Hofbrau Beer Garden, The Back Porch Seafood and Oyster Bar, Long Horn Steaks, Starbucks, Olive Garden, Wild Wing Café, Reggae J’s, , Five Guys Famous Hamburgers, Panera Bread to mention a few. Add to this the shopping options at Dillard’s, J C Penny, Old Navy, Ron Surf Shop plus hundreds of specialty shops along with a 16 screen Grand Theater and IMAX Theater. A super Wal-Mart is just down back beach road next to Pier Park! Please don’t forget about the Ebro Dog Track with Simulcast wagering on all the nation’s top horse tracks, and the brand new 22 table poker room just 15 minutes away. Games of Texas Holdem, Stud and Omaha are waiting for you. What a great location…..the Tidewater Resort is less than a mile from Back Beach Road and Frank Brown Park giving you easy access to all PC beaches from Thomas Drive to the East or West to Sea Crest Beach on 30 A. Stay with us and we can advise of activities off the beaten trail that will enhance your visit and save you money. The condo was clean and comfortable. The owner is very accomodating. Great views of the sunset! I didn’t want to leave! My only complaint is about the elevators. So many people, so many floors, so much waiting. The property, the view, furnishings, location...it was perfect! I can't say enough good things about this condo-it was the best choice we could have made. The unit was extremely clean and inviting - not to mention perfectly decorated. The owners Jon and Theresa were extremely responsive and courteous. We immediately felt at home here. We had everything we needed by way of kitchen appliances and utensils. We were even provided with a starter kit of certain items like dish and laundry detergent. If you're a fan of soft beds, you will LOVE this condo. The king size bed and comforter surrounds and cuddles you to the height of relaxation-there truly is nothing better than waking up in that bed with the gorgeous view just outside the balcony. For the downsides: The building amenities were a little lackluster. The tiki bar was never open the two times we tried to visit and the building itself seemed like maybe it had seen better days in our opinion. As for the elevators that everyone reviewed, the only time we noticed a large delay was on our Saturday check-in day. The elevators really only fit one luggage cart so we did have to wait awhile because of everyone else checking in-but really, not a big deal! As for the unit, the only negative thing I have to say is that the dryer sometimes took two or three cycles to get the clothes dry. Again, not a big deal - just set it on a new cycle and go down to the beach! If you're looking at 10, 15 other condos right now, just stop. You're already looking at the perfect condo right now! Great value at a great price. Thank you Jon and Theresa! We really enjoyed our stay at Tidewater 1215. The beach chairs are included in the unit which was a plus! The room itself was clean and nicely decorated. The owners were on top of everything and quick to respond to a question or any of our needs. Highly recommend staying here. My family loved it! The room was perfect! Very clean and up to date! Excellent view of the ocean! Elevators are slow but that’s the ONLY drawback. We will return! A ONE TIME, FLAT $25 PARKING AND AMENTIES FEE WILL BE COLLECTED BY RESORT AT CHECK-IN!!!!!!!!!!!!!!!!!!!!! !No Pets! No Smoking! Guest must be 25 or older and must remain for the duration reservation. If reservation is canceled 60 days prior to arrival, all funds will be returned minus the $50 administrative fee and credit card transaction fees! Prices subject to change without notice until reservation confirmed!